President Donald Trump’s morality, character, honesty and mental stability became the political world’s hottest topic last week when the nation’s chief executive reportedly referred to Haiti, El Salvador and African nations as “shithole countries” — then denied doing so. But even State Senate Republican Leader Len Fasano, who makes a point of trying to keep Trump’s issues from affecting Connecticut Republicans, called on Trump to apologize for his remarks. Trump’s mental state and fitness to be the nation’s chief executive already had been called into question earlier in the week with the release of Michael Wolff’s instant best-seller “Fire and Fury,” and had gotten an extra bump from a group of psychiatrists led by Dr. Bandy Lee of Yale. Trump’s tweeting also had caused confusion over the vote on a bill that would allow the National Security Agency to intercept without warrants calls or emails from suspected foreign terrorists outside the United States. Connecticut Democrat Jim Himes, 4th District, was the only member of the state’s House membership to support the measure, which passed. The federal government also cleared the way for states to begin imposing a work requirement for recipients of Medicaid — something Gov. Dannel P. Malloy said he would not do. In Connecticut politics, meanwhile, hope springs eternal, and candidates and potential candidates for elective office sprang forth in large numbers last week, encouraged by a larger-than-normal turnover of high state offices. Former Secretary of the State Susan Bysiewicz and Ned Lamont, an unsuccessful senate and gubernatorial contender, both showed an interest in running for Malloy’s job, but they were by no means the only ones. Danbury Mayor Mark Boughton, former Veterans Affairs Commissioner Sean Connolly and businessman Guy L. Smith IV were just a few of the many seeking to join the unprecedented scramble for the chief executive’s chair. Some candidates, like Middletown Mayor Dan Drew, already may feel themselves being thinned from the herd. Drew dropped out Friday. Mike Handler has the floor at the recent Republican candidates forum. From left are Mark Boughton, Steve Obsitnik, Dave Walker, Peter Lumaj, Prasad Srinivasan, Mark Lauretti, Tim Herbst and Toni Boucher. Justice Andrew J. McDonald, left, and Gov. Dannel P. Malloy. 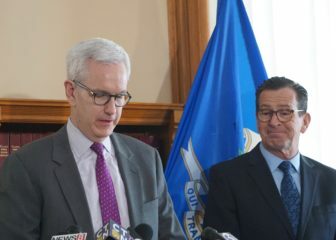 Malloy also nominated Justice Andrew McDonald, the state’s first openly gay justice, as his choice for the position of chief justice of the State Supreme Court. The state attorney general’s seat will be up for grabs this November, too, so Clare Kindall of West Hartford became the third candidate to declare for that job. State Treasurer Denise Nappier also has decided to retire, so Shawn Wooden, the former president of the Hartford City Council, and state Sen. Art Linares, R-Westbrook, have opened campaigns for her job. State officials of all stripes will have plenty of problems to keep them busy (and candidates things to criticize) in the weeks and months ahead, not the least of which is Connecticut’s ongoing budget deficit, made even larger by the legislature’s decision to reverse cuts to the Medicare Savings Program affecting some 113,000 people. Perhaps ironically, a recent $900 million uptick in state income tax receipts will only provide about $10 million to use against the deficit. Among other things, more money is needed to help Puerto Ricans who migrated to Connecticut after Hurricane Maria, officials say.